The average North American spends 90% of their time indoors, and we Canadians can spend up to 98% of our time indoors during the winter. This isn’t an inherently bad thing; the outdoors can be a bit harsh sometimes (just ask any Winnipegger how their February was! ), but just because the indoor environment is warm and cozy, doesn’t mean it can’t be harsh, too. The home can be a risky place, and sometimes that risk presents a dilemma, such is the case with fire and flame retardants. Fire is a major hazard to urban areas and can cause extensive damage to cities and result in great loss of human life. In the home, the major causes of fire include cooking equipment (accounting for nearly 40% of all home fires), heating equipment (18%), electrical distribution and lighting equipment (6%), intentional (5%), candles (4%), smoking materials (4%) and playing with a heat source (2%). Knowledge is power, and knowing the causes and where fires start in the home has led to great efforts to improve fire safety. These improvements include increased use of smoke detectors (test your detectors once a month, and change the batteries twice a year! ), sprinkler systems, and various public awareness campaigns ranging from the risks of smoking to the danger of using turkey fryers. In addition to these campaigns, specific flammability standards for products like foams and plastics were introduced. To meet these standards, manufacturers have historically relied on the incorporation of brominated flame retardants (BFRs) into their products. The reason for the incorporation of BFRs is to slow the spread of fire and increase the time to flashover (flashover is the temperature point at which the heat in an area is great enough to ignite all flammable material simultaneously). More time to flashover means more time to escape a burning building, and in a fire – every second counts. Due to those added few seconds, BFRs, specifically the polybrominated diphenyl ethers (PBDEs), were incorporated into countless products, such as ignition-prone parts of electrical equipment and appliances, especially wiring; circuit boards and plastic cabinets; synthetic textiles such as nylon and polyester used in upholstery and curtains; and cushioning, such as polyurethane foam. Given that we can find nearly all these materials in our homes, incorporation of PBDEs seems like a good intervention to help improve public safety, but that isn’t the case. Maybe if PBDEs would stay put, then their inclusion in household products wouldn’t be so bad. But PBDEs often like to flee from the products they are added to, and once out, they can cause some problems. In the home, deteriorating furniture, mattresses, carpet padding, and electronic equipment can give off PBDEs that are tightly bound to dust particles. Ingestion of house dust represents an important pathway for human exposure to PBDEs, particularly for young children who consume at least double the amount of dust as a typical adult. This is where the amount of time we spend indoors becomes really scary! In addition to finding PBDEs in our homes, we find PBDEs all over around the globe, in far off places like the Arctic, Tibet, and in nearby places like our fat. And if that isn’t bad enough, certain forms of PBDEs are toxic and may affect the endocrine system, alter neurological and sexual development, impair or compromise the immune system, and may be linked to the induction of tumors and cancer. The persistence and widespread distribution of PBDEs in the environment, combined with their tendency to bioaccumulate and cause toxic effects led to them being banned and ultimately phased out of production. But the phase out isn’t all good news; we still have to worry about fire safety and by phasing out the PBDEs some industries worried they wouldn’t be able to meet the flammability standards for their products. So instead of using PBDEs, they started looking for alternative flame retardants, like HBCD, BEH-TEBP, EH-TBB, BTBPE, and TCDPP to name some, but by no means all. 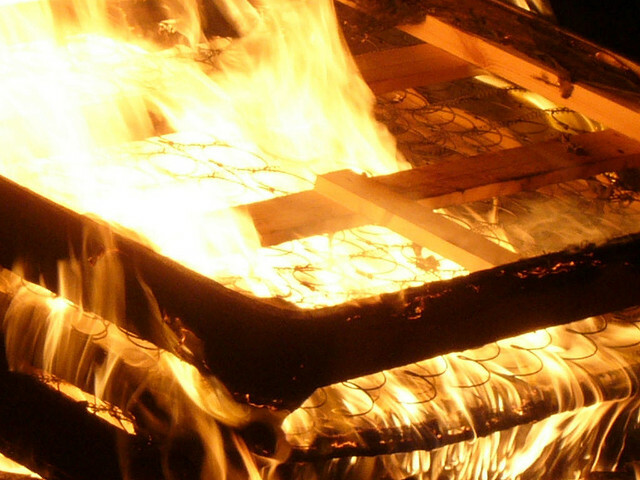 In fact, it is difficult to get an idea of what flame retardants may be in a product, because unlike food labels, there is no requirement to report what compound, or compounds, are added to a product, you only need to report that it met the flammability standard, check out your mattress tag for an example. While these compounds were able to perform just as well as the PBDEs in terms of flammability, much less was known about their persistence, bioaccumulation potential, and toxicity. Work out of Duke University has shown that these new flame retardants are present in our furniture. In fact they tested the foam from 101 American couches purchased between 1984-2010 and found that 85% of them contained flame retardants, either previously identified as toxic, or having inadequately tested. And just as the PBDEs, these compounds are also fleeing our products and are being detected in household dust. Rather than going back to the drawing board and trying to find new chemical substitutes, it is time to re-evaluate why and how we use flame retardants. The argument for the incorporation of flame retardants has always been that they are a successful means of slowing the spread of fire and thus save lives. However an award winning series by the Chicago Tribune titled Playing With Fire examined those claims and found that foams treated with flame retardants did not offer a greater level of open flame safety than untreated foams. The danger from fire is very real and we have learned through experience how to minimize our exposure to it through awareness and technology. While the danger from flame retardants is more difficult to see and less well understood, we should learn to minimize our exposure as well. This too can be achieved through awareness and technology. We can choose to seek out companies and products that are BFR free, and design and technologies are making them more common. But perhaps one of the easiest ways for us to reduce our exposure is to simply go outside.